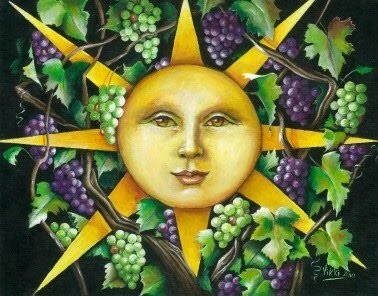 Litha or Summer Solstice contains powerful themes that are of interest to Christians and Pagans alike. In fact, I suspect this powerful day in the Northern Hemisphere has been revered ever since human beings began noticing the cycles of nature around them. The term Litha comes from the Anglo-Saxon phrase Aerra Litha, which means “before Midsummer.” For many Pagans it is a day with the themes of fertility and fire, since the Goddess is fully pregnant with child and the Sun God is at the height of his power. In earlier times Europeans farmers lit bonfires to mark this day and then spread the ashes over their fields to insure fertility of their crops. For both Pagans and Christians this is the perfect time of year to celebrate the gift of life with bonfires, which for any of us have become charcoal and gas grills and fire pits! This weekend is also Father’s Day which means it’s a great day for family get-togethers and picnics. This is definitely resonates with the spirit of Litha. This entry was posted in Litha, Liturgical Calendar, Midsummer, Wheel of the Year and tagged Christian, Litha, Midsummer, Pagan, Sabbat, Summer Solstice, Wicca. Bookmark the permalink.